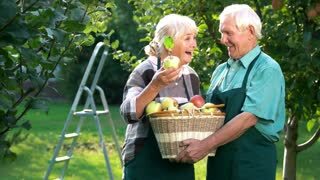 Senior couple holding apple basket. Woman and man smiling outdoors. Fruit gardening guide. Senior couple with flower basket gardening. 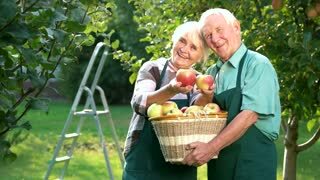 Senior couple holding apples. Cheerful people in aprons outdoor. When to harvest fruits. 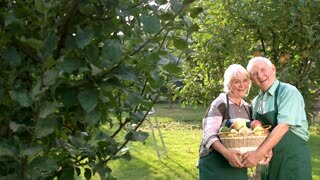 Elderly couple holding apple basket. Happy woman and man outdoors. How to grow fruits. 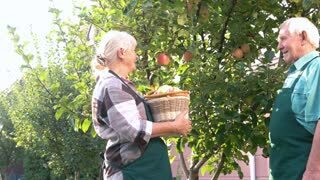 Couple with basket picking apples. Old man and woman outdoor. Useful gardening tips. Cheerful couple holding apple basket. Old man and woman smiling. Become a gardener. Couple holding basket and laughing. Happy seniors outdoor. Home is where love is. 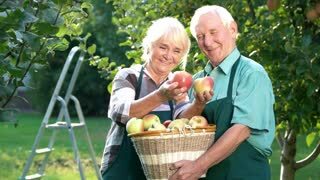 Two senior people picking apples. Woman holding basket and smiling. Fruits of our labor. Couple holding apple basket. Senior gardeners in aprons. The wealth in our hands. 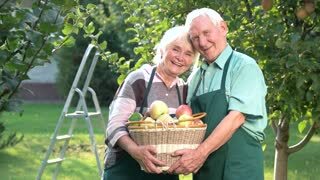 Senior couple and apple basket. Man with woman outdoor. Holding the wealth. Couple of senior gardeners smiling. Old man holding apple basket. Fruits of spring. Senior hands and fruits. 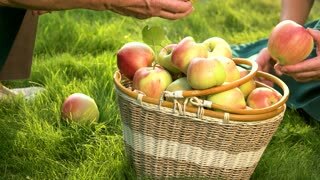 Apple basket on grass. Gardening as home based business.